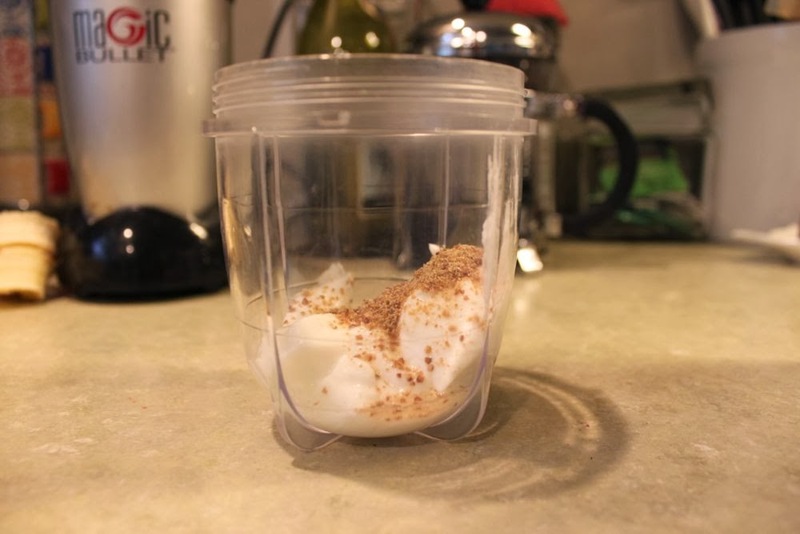 Ground cinnamon – this is my secret ingredient! Ceramic squirrel cookie jar is optional. 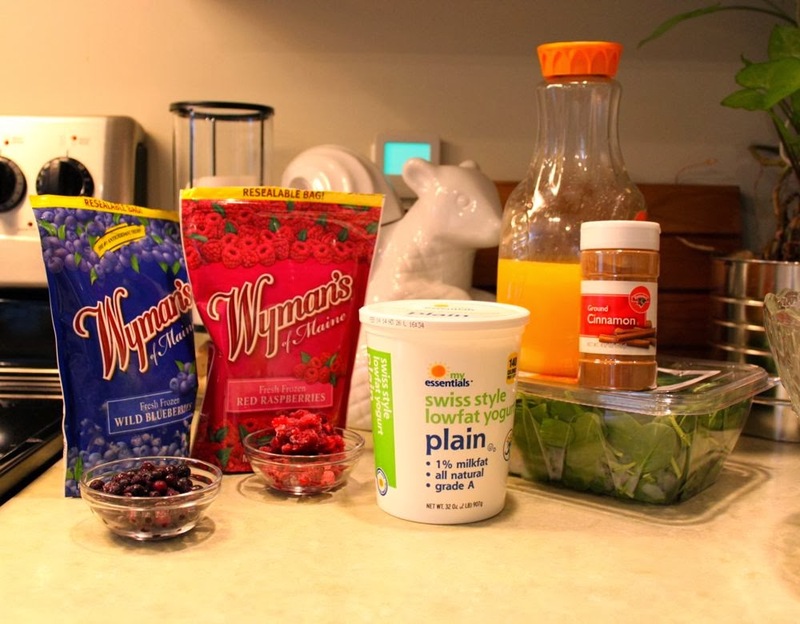 Chia seeds or unflavored protein powder (or both) – I like to add these in sometimes if I feel like I haven’t been getting a lot of protein or fiber, or if I’m going to be working out that day. 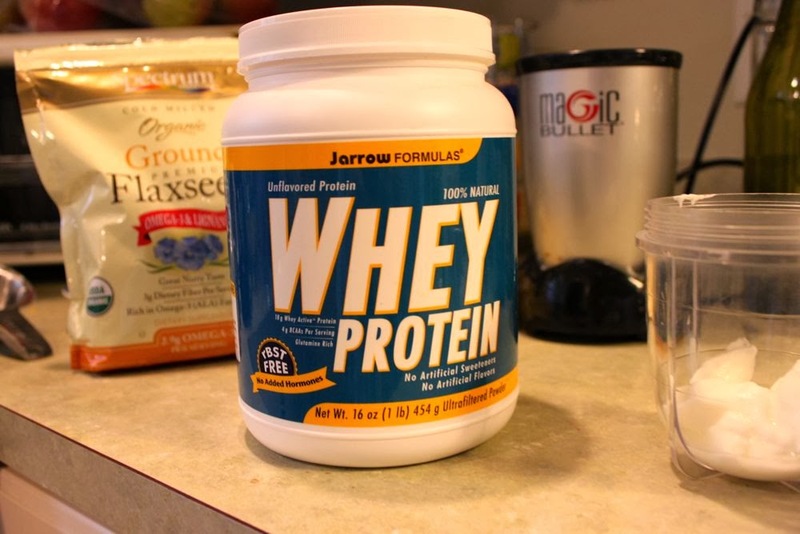 Side note: I sort of feel ridiculous having a big canister of protein powder in my pantry since I’m not a body-builder, but I think a lot of dancers don’t get enough protein during the day and I’m one of them, since I could live on pasta and cereal and not bat an eye. 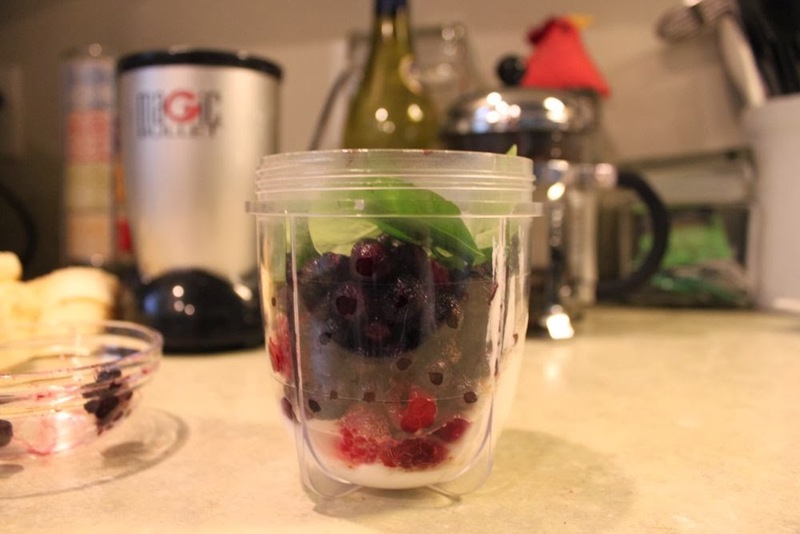 Ok so to make your smoothie, scoop out some yogurt into your blending apparatus. 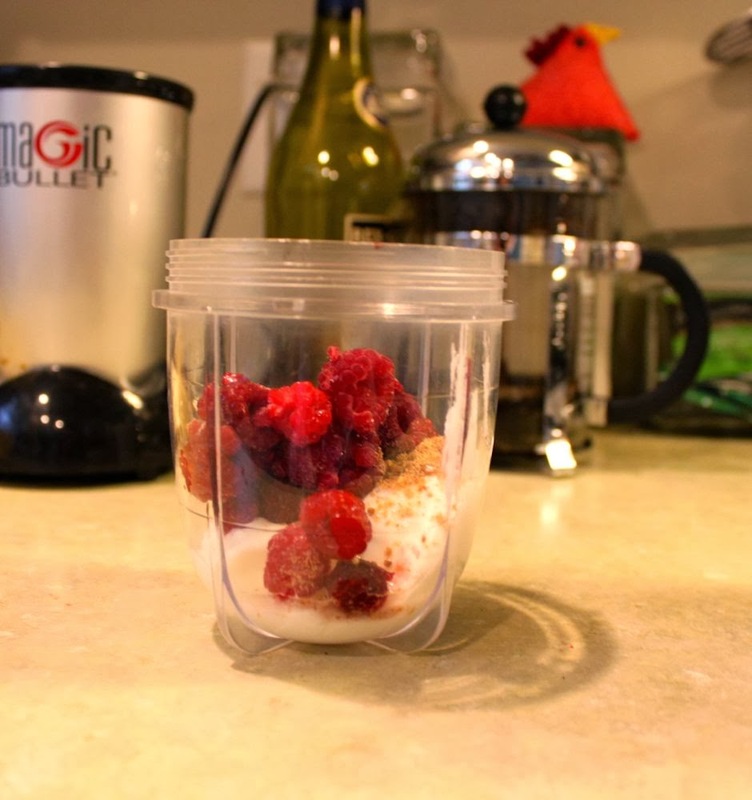 I use my Magic Bullet that I got in college – it’s still going strong! 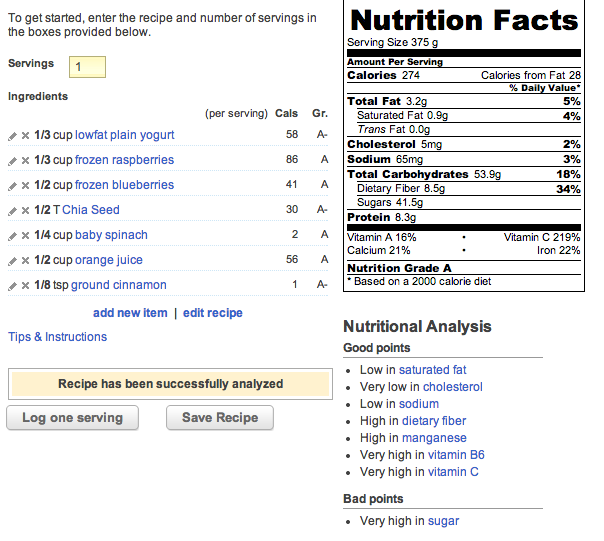 I like to add my chia seeds or protein powder – I think it mixes in better so you don’t taste it if you put it in here. I like to use frozen fruit because it turns out more like ice cream-consistency. 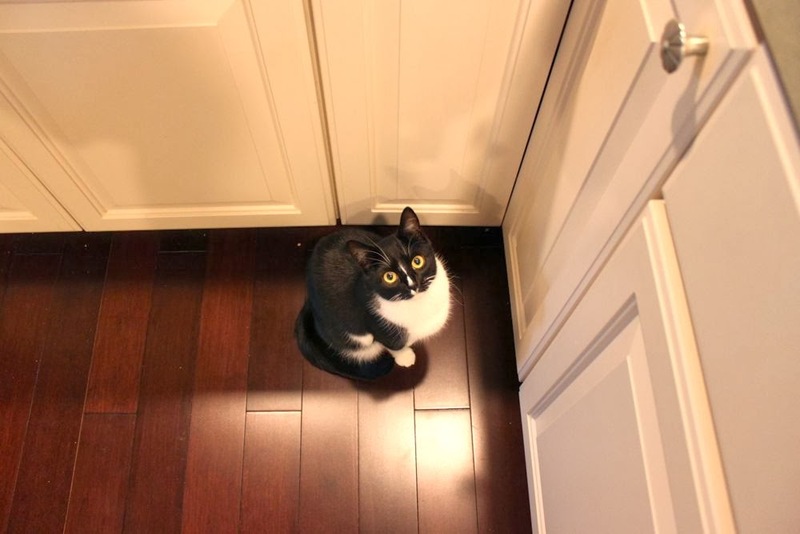 Then ignore the begging cat on the floor next to you. 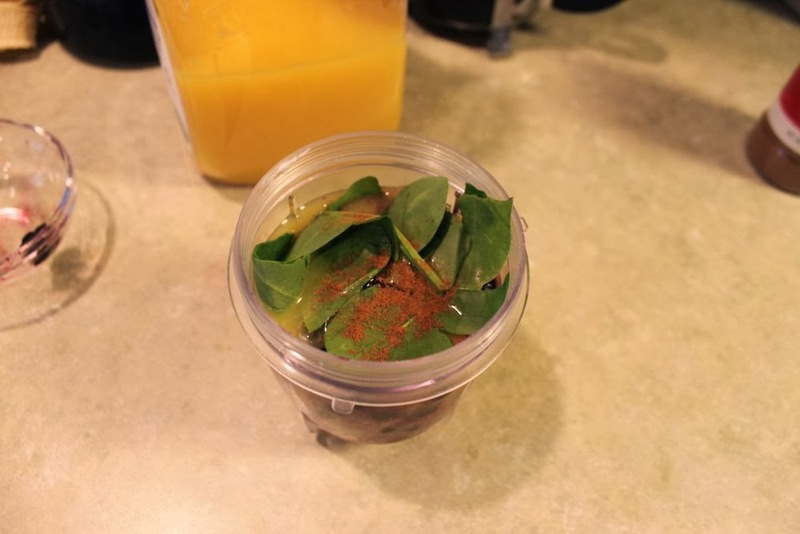 Add in a few leaves of baby spinach because you really won’t taste them or know they’re in there. I repeat – you will NOT taste the spinach! Your drink will not be green! Scout’s honor. I tear them up a bit so that they are easier to blend. 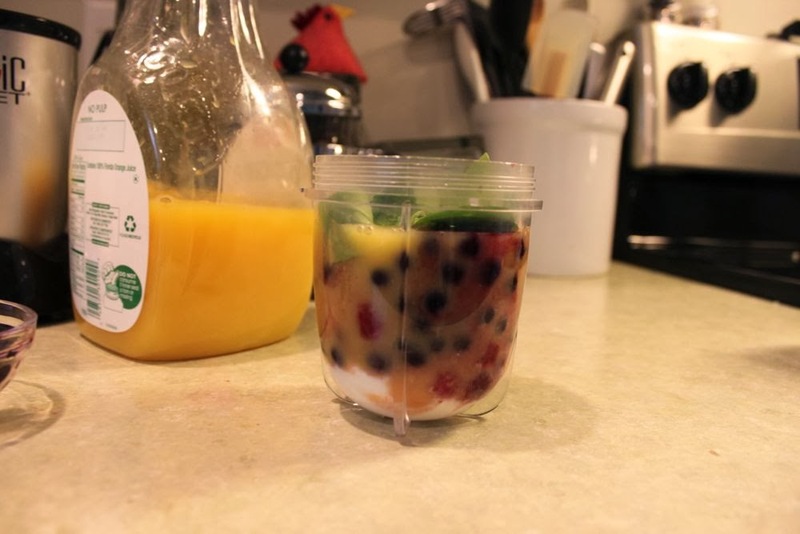 Add orange juice until it covers the top of the fruit. 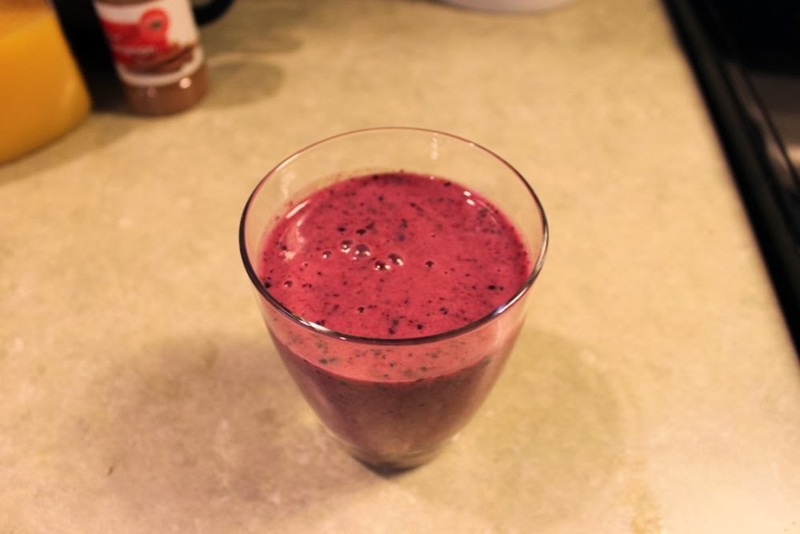 If you add too little, it will not blend properly. You can add too much and it will be soupier, if you like that sort of thing. Now the secret ingredient! A dash of cinnamon. 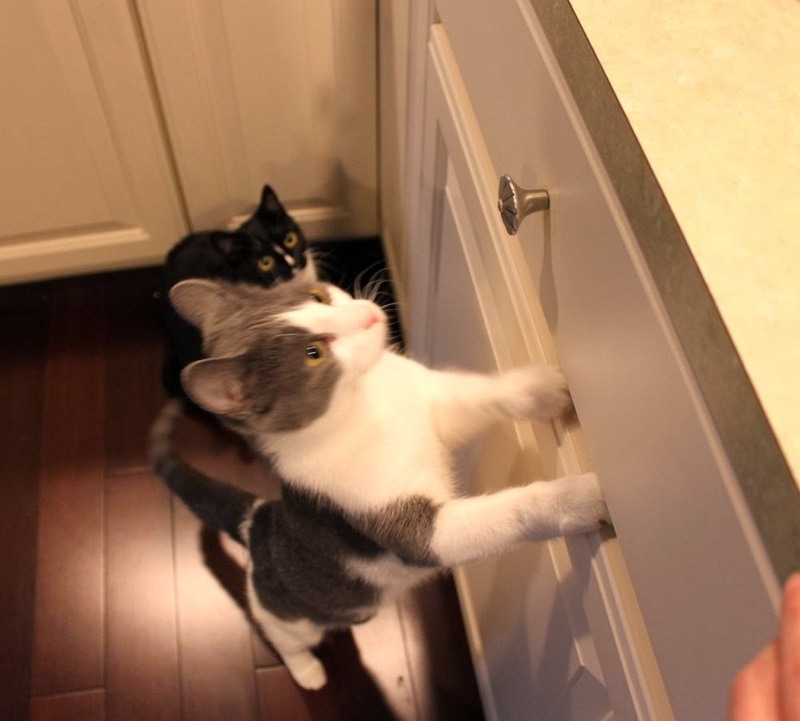 Ignore the second cat that is now interested in your smoothie. That’s it! 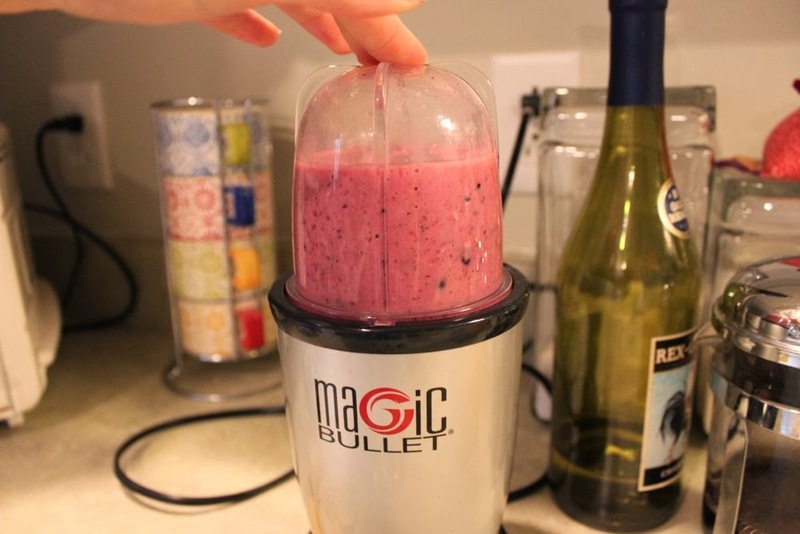 Now blend! 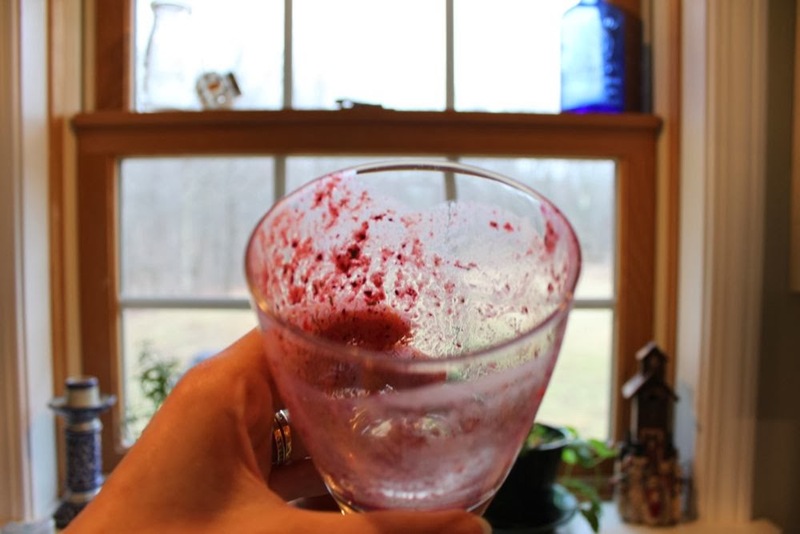 I blend for 10-15 seconds, until the drink is a lovely shade of pink/purple. Please ignore my messy counter and open bottle of wine. Thank you. There you have it! 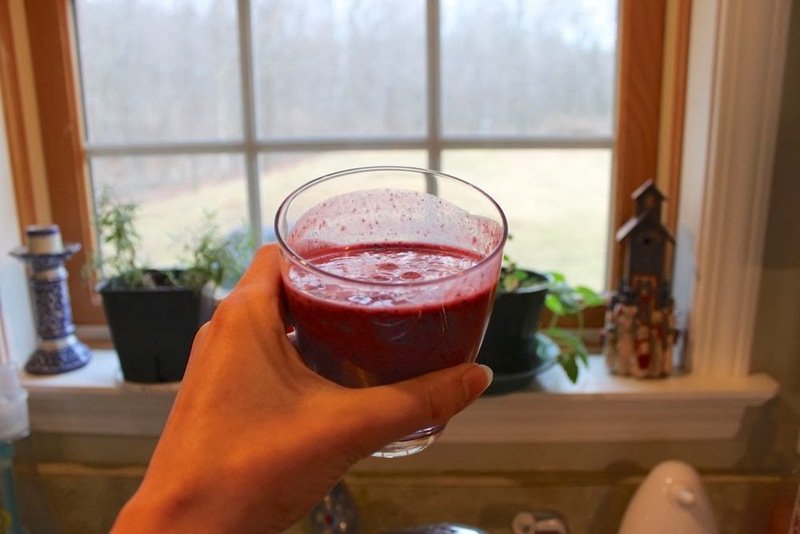 Super easy – takes about 5 minutes in the morning and is a delicious and healthy way to start the day. 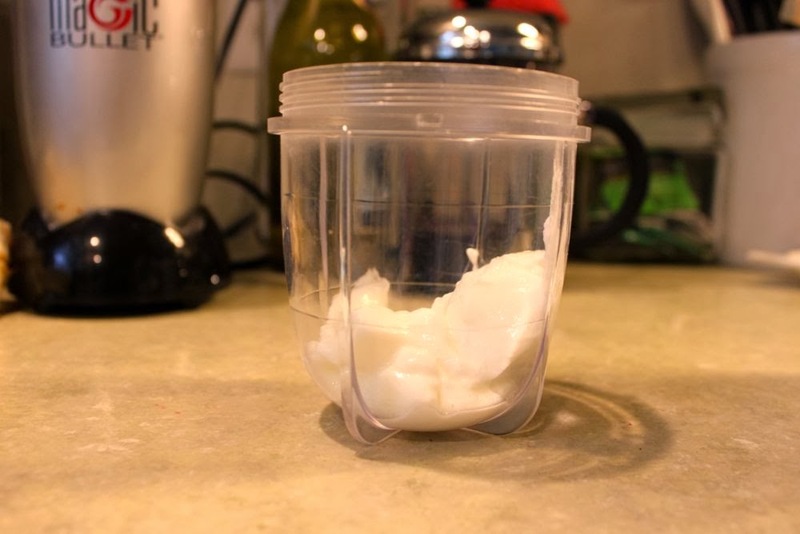 Place yogurt, seeds/protein powder, fruit and veggies in blender. Add orange juice just until everything is covered. 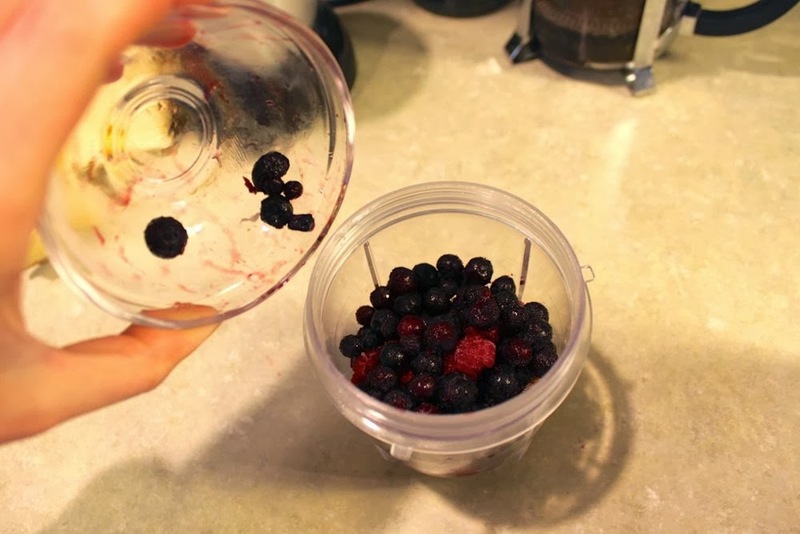 Blend until everything is mixed (approximately 10-15 seconds) & enjoy!